Traveling to Germany soon on business or vacation – or just want to engage in a little virtual tourism on your lunch break? 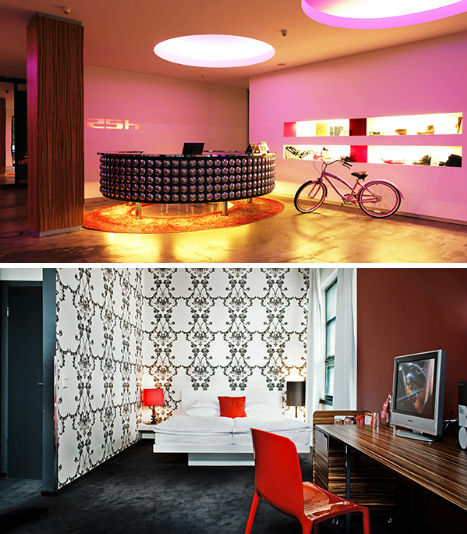 These 13 awesome hotels and hostels represent the incredibly fun, eclectic mix of lodging that Germany has to offer in cities like Berlin, Stuttgart and Cologne. 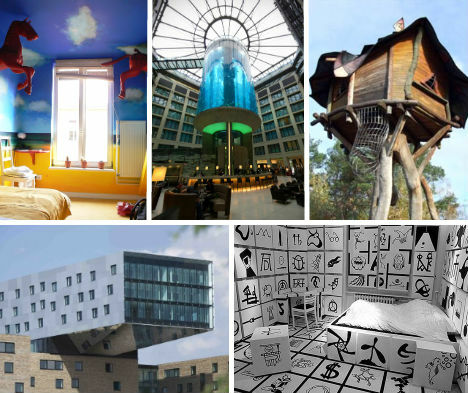 From a wacky art hotel with 31 themed rooms to a modern musical masterpiece where you can rent a Gibson guitar through room service, these hotels will make you want to pack your bags and say, ‘Guten tag!’ Owning a hotel as fascinating and interesting as one of these would surely be the dream of any aspiring hotel owner. However, no matter what kind of hotel you have, you will want to make sure that you’ve got a reliable and functioning hotel property management system to ensure that the process of running your hotel goes smoothly every single day. There’s a room with a flying bed, another with coffins for beds, one with elevated cages so you can put on shows for neighboring rooms and even an upside-down room with furniture on the ceiling. 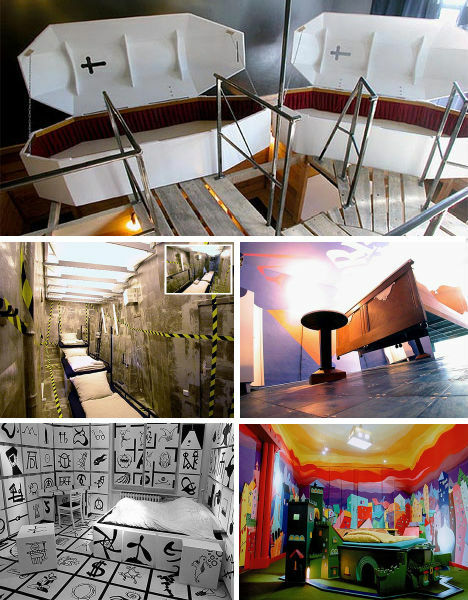 Pretty much any bizarre hotel room you can imagine can be found at the Propeller Island Hotel in Berlin, where the 31 unique themed guest suites will make you want to switch rooms every night of your stay. 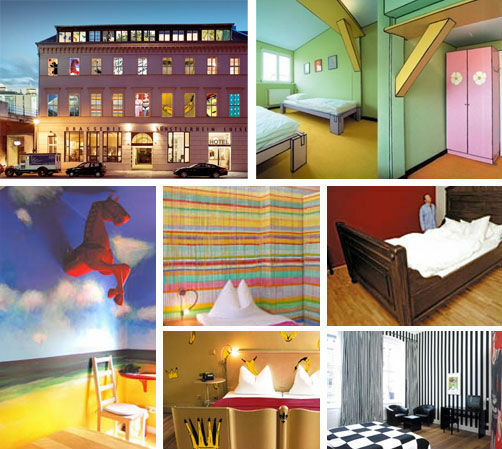 If colorful and artistic rooms that don’t look like torture chambers are more your speed, Berlin’s Art Luise Kunsthotel offers a veritable gallery of unusually decorated rooms. The pastel Kehl’s Comin room will make you feel like you’ve stepped into an illustration with its black-outlined furniture, while the surreal Red Horse room is named after an equestrian sculpture emerging from the wall. The Nest Room features a two-foot-long bird’s beak over the bed and much-larger-than-life eggs scattered around the space, and the Silke Vollmer’s Flight room is filled with airplane remnants. Car enthusiasts can’t pass up the V8 Hotel in Stuttgart, a four-star establishment where many of the 34 guest rooms are decked out in vehicular-themed décor – a choice that makes more sense when you find out that the hotel is located on the grounds of a car museum. 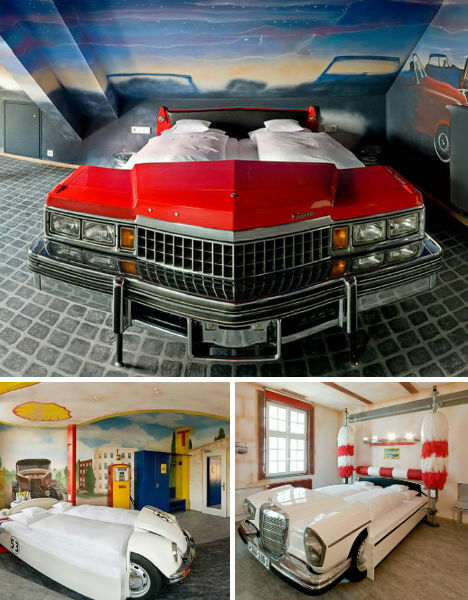 Not only are the beds nestled into frames made of classic cars, but the rooms have their own unique themes, like the car wash room, the Shell gas station room and a mechanic’s room. Have you ever thought to yourself, ‘On this trip, I absolutely must sleep inside a water tower!’ Okay, probably not. But you can do just that at the Hotel Im Wasserturm in Cologne. 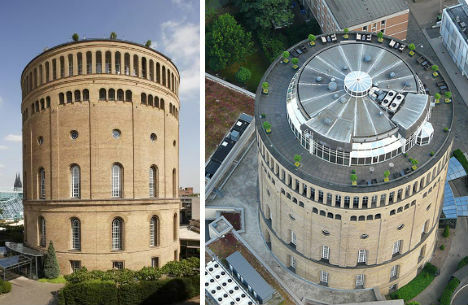 The luxurious 88-room hotel is housed within what was once the largest water tower in Europe, now 130 years old. Design lovers who’d rather kick the kitsch in favor of something fresh and modern will love Nhow Berlin, a music-themed hotel with a cantilevered metallic exterior and a fluid, largely pink-and-white interior. Designed by Sergei Tchoban, Nhow Berlin boasts a state-of-the-art recording studio, first-rate DJ’s playing in the bar, regular concerts and live events and an on-staff music manager. You can even rent a Gibson guitar through room service. 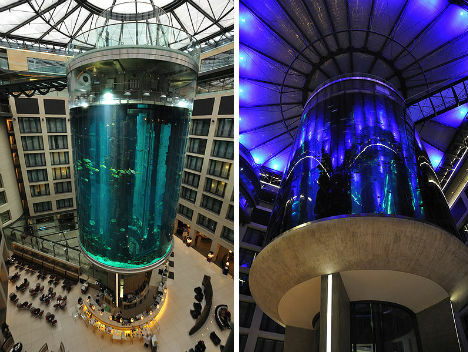 The Radisson Hotel in Berlin is home to the world’s largest cylindrical aquarium, which acts as a stunning centerpiece in the lobby. Over 82 feet high and 36 feet in diameter, ‘AquaDom’ is home to 2,600 fish of 56 different species. The hotel elevator goes up through the center of the acrylic cylinder, and some lucky guests get to gaze at it from their windows. If you’re just on a short trip to Europe, you can still experience its many nations (in the faux mini-metropolis style of Disney’s Epcot or Las Vegas casinos) at Germany’s largest theme park, Europa Park. 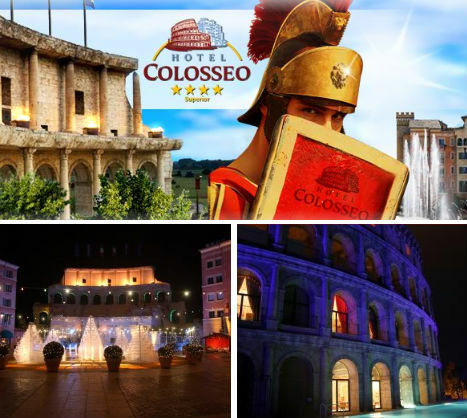 The park, which is divided into sections named after various countries including Italy and Iceland, is also home to five full-sized hotels including Hotel Colosseo, a Roman-style resort inspired by the Colosseum. The hotel even has its own versions of Rome’s many fountains. 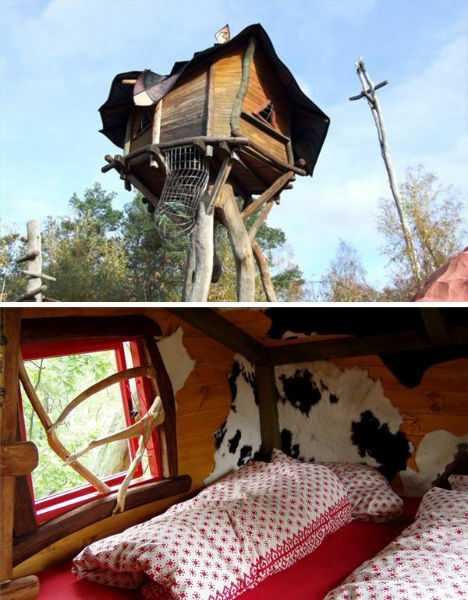 If you’re into something rustic but no less unusual, how about a stay in an actual tree house? The Baumhaus Hotel just outside Görlitz opened in 2005 with five tree houses to choose from, some perched between branches and others free-standing. Much like at a camp, you’ll find basic sleeping accomodations in the tree houses themselves while the central area offers campfires, toilets and a true German perk: beer-filled mini-bars. This hip boutique hotel was designed by none other than GRAFT studio, known for being a favorite of architecture-loving actor Brad Pitt. The award-winning interior design focuses on fluid lines – you’ll find very few right angles in the 77 understated guest rooms, where neutral tones and wood grain are occasionally punctuated with a pop of dramatic red. Can a budget hotel with minimal funds for decorating be cool and stylish? 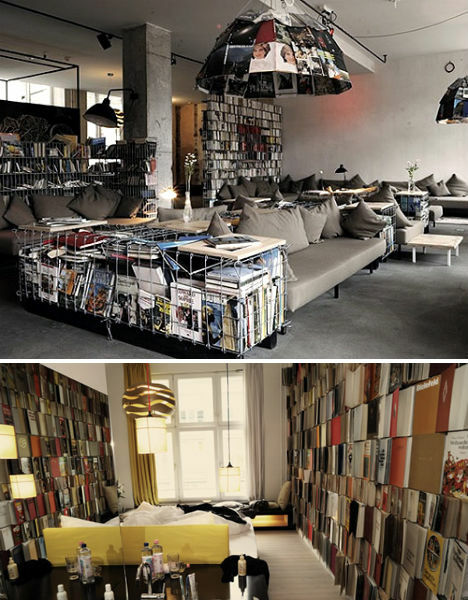 The answer to that question is clearly yes, if you’ve ever seen the Michelberger Hotel in Berlin. A group of friend got together to create a low-cost hotel with a comfy vibe that makes you feel like you’re crashing at a friend’s place. It’s fun, bright and airy with incredibly creative touches like a lobby decorated exclusively with magazines and a guest room wall covered in old books. 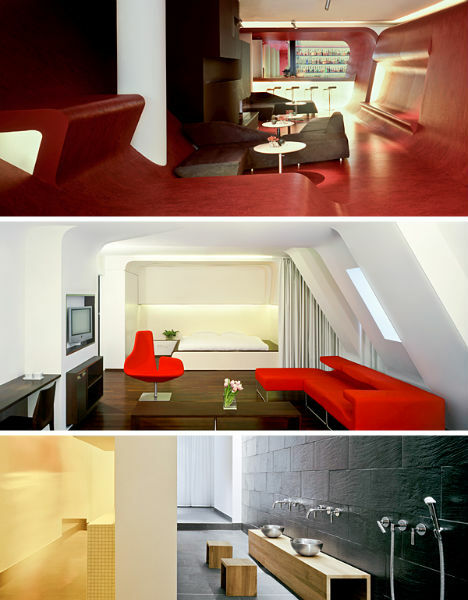 Still more proof that you don’t have to have a lot of cash to stay in a super-cool stylish hotel is the 25Hours Hotel in Hamburg. Designed by 3META with an open floor plan emphasizing communal space and a retro 1960s vibe, the 25Hours Hotel is packed with 420 convex chrome mirrors, shag carpets and mod lighting. It’s German in origin and spirit, but when you stay at this hotel, you can go practically anywhere. 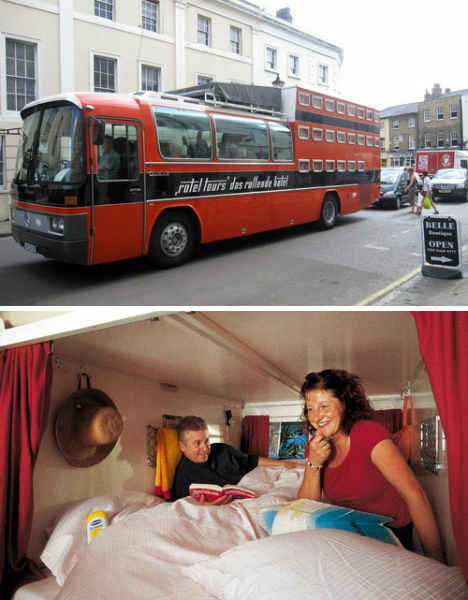 A company called Rotel Tours takes travelers on journeys across Europe, Africa and Asia in modified buses with individual curtained bunks measuring six feet long, three feet deep and three feet high. There’s a toilet, but you can only shower when the bus makes an ‘occasional’ stop at a campground just for this purpose.